Andrews McMeel Publishing, 9781449487959, 152pp. Warm and inviting, but (like an apron) quite practical, The Apron Book is a celebration of a great American icon. 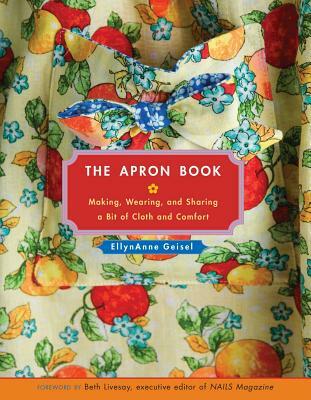 Apron enthusiast Ellynanne Geisel, who curated the traveling exhibit, Apron Chronicles, returns us to hearth and home in this updated edition of the award-winning book. In this paperback edition, EllynAnne reflects on the grassroots movement of apron love in a new introduction, and a new foreword by the former editor of Apronology magazine expounds on EllynAnne's mantra that aprons don't hold us back; they take us back because the connection to the past is a strong one. The Apron Book showcases full-color photos of new and vintage aprons from Geisel's vast collection, patterns for four basic apron styles and myriad variations, recipes, tips on collecting and preserving vintage aprons, and heart-tugging stories from the traveling apron exhibit. The book also explores the history and heyday of aprons and looks at the various roles aprons still play when worn in the kitchen, around the house, by the backyard grill, on the job, or for a special occasion. EllynAnne Geisel, who lives in Pueblo, Colorado, is the author of The Apron Book and the creator of Apron Chronicles, the traveling exhibit. Her apron designs have appeared in Vogue and have been worn by Bree in Desperate Housewives. She's been a guest on both NPR's All Things Considered and CBS News' Sunday Morning. She continues to make nationwide appearances to promote her books and exhibit.